AquaMarine Diving – Bali’s PADI Rescue Diver Course is for those looking to improve and expand on their in-water skills by learning about safety and first aid in a diving context. PADI Rescue Diver Course, Surfacing the Unconscious Diver. By the time you finish the Emergency First Response and Rescue Diver courses, you’ll be a qualified first responder – whether an accident occurs in or out of the water. 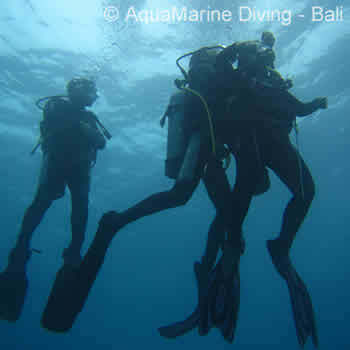 How does AquaMarine Diving – Bali take a subject like “accident prevention and management” and turn it into fun? We give you the PADI Rescue Diver (or PADI Junior Rescue Diver course) in Bali! This course teaches you to focus on other divers as well as yourself. It shows you how to recognise and prevent potential diving accidents before they occur, and how to handle them if they do. During the course you’ll learn how to effectively perform diver-assists and rescues, manage diving accident situations, and render first aid. The programme is an important step in expanding your knowledge and experience as a diver. This is also a great course for younger divers, showing them how to be responsible in the water both for their own benefit and for others diving with them. We require divers to complete their EFR (Emergency First Response) course before starting their Rescue Course. This can be done prior to your arrival or we can complete the course at our south Bali office. This certification (or equivalent) must have been completed within the previous 2 years and issued by an internationally recognised institution.